At the risk of giving away my age, I couldn't resist the play on an old Dylan song. Woke up at a little before noon ... Gott sei Dank for holidays in the middle of the week, and the Partnerin asked me to bake scones. What the heck. Cinnamon-raisin sounded good, and we had all of the ingredients except for allspice ... can you even find that in Germany? Gotta ask Mausi ... she knows everything about these things. Anyway, these didn't look so pretty, but they were lovely to eat. 8 oz. of butter (about half a brick of the stuff they sell here), cold!!! Preheat oven to 375° Fahrenheit ... about 190° Celsius if I did the math right. Mix the dry ingredients in a bowl, then add in chunks of the butter. You can then use two table knives to cut the stuff in, but it would probably be better to use your hands to rub the powder together with the butter until it looks rather flaky (if you do it right, it gets the look of oat flakes). Toss in the raisins, then use a fork to mix in the milk. After it all comes together in a nice gooey ball, you can dump it out onto a lightly floured board, or if you are too lazy to clean another board you can still use the bowl, use your hands to knead it a few times through ... 10 to 15 if you don't mind sticky hands (after one, do the next 9 to 14 times really matter ???). Divide into 8 chunks of dough, and put those on an ungreased cookie sheet (non-stick if you've got it ...if you don't, then what decade are you from?). 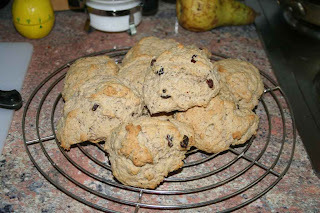 8 chunks will give you rather large scones ... if you are feeling miserly, you should probably rethink your priorities since stretching scones in a not-for-profit kitchen is a bit over the top, but to each his own and you can certainly get more scone-count out of this recipe if that is what floats your boat. Bake for roughly 10 to 15 minutes, unless you set your oven too slow like I did today in which case 17 minutes seemed in order, but in any case until they are lightly browned on top. Let them cool on a wire rack for a few minutes while your partner(in) runs to the gas station to buy butter since you used it all up making the scones ... buying butter at a gas station is a german thing ... you'd know if you lived here. Have with tea, or diet coke if you are a sick American type like me. Enjoy! Allspice is "Piment, gemahlen", sometimes called "Nelkenpfeffer". You can buy it in the baked goods or spice section of most German supermarkets. Aargh, not in the *baked goods*, but in the *baking ingredients* section. I'm a Diet Coke man myself (here, unfortunately, that means Coke Light). Norma got in a stock of Coke Zero this week, so I grabbed a bottle. I've seen it before at Wally World, but never tried it. My Nephew swears by it. I'm not sure exactly what the difference is between Coke Zero and Coke Light (the label says Coke Zero has "echter, voller Geschmack"), they both have no sugar and loads of chemicals in them. I tried it and it's not bad. Yum. Those look just the way scones are supposed to look. And now you know where to get the allspice.